The Incident Management process evaluates the various requests, problems and questions that users send to the IT team after an event arising from new requirements, malfunctions or disruptions. The goal of Incident Management is to rapidly resolve the requests or problems raised so as to minimise the impact of the reported event on current and future business activities as much as possible. Once the Incident is opened, the IT department examines the nature of the request, ensuring a constant and updated flow of information with the user who opened the ticket, and evaluates the impact and potential link to the problem causing the event. 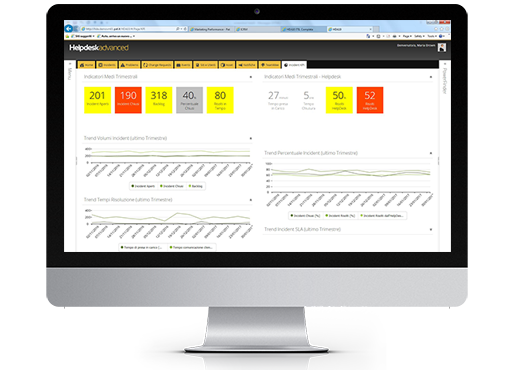 As a Service Management solution, HelpdeskAdvanced, is the pivotal point of contact for all end users. A single service governance tool, which automates the Incident process through an intuitive web interface for users and support staff, defining user contact channel, service levels, allocation methods, resources assigned to manage and authorise the processes; the completion procedure as defined by the SLA or Service Level Agreement ; and the process of communicating resolution and related impact on business operations. HelpdeskAdvanced helps you proactively and promptly manage various kinds of Incidents, ensuring your users full availability while their requests go through the resolution process, and rapidly restoring their daily services to the usual standard. The solution uses cross-channel communication, whereby the channels provided by the company (telephone, email, IVR, SMS, user portals, chat etc.) are integrated within HelpdeskAdvanced and used to streamline communication between users, IT team and the company. Speed up allocation of users’ requests and respond in line with the SLA. Monitor service performance to activate and resolve requests rapidly. Enhance User Experience offering different modes of contact. Guarantee quality in service provision.